Gear is an important part of bicycle travel as it will help to keep you safe and comfortable, but at the same time having all the perfect gadgets shouldn’t be overestimated. It is perfectly possible to travel the world with affordable new or second hand bikes, clothes and camping gear, as I did when I was in my twenties. 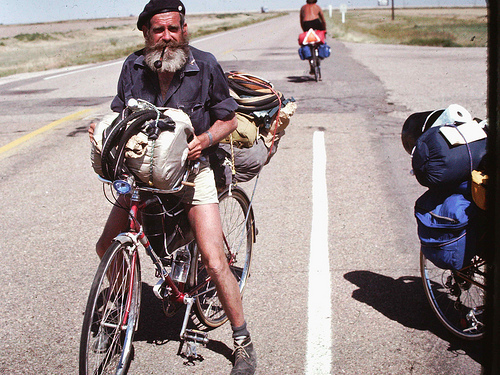 My first big solo tour of 3 months cost me very little in the preparation phase as I used my dad’s old bike and bought second hand panniers of the internet. Me and Cyril are now at an age where we have a little bit more money and we like to spend it on a little bit more comfort, especially since we’re going on a year long tour and will be living in our tent a lot. This is reflected in the choices we made with regards to buying a larger but super light tent, bringing little camping chairs and a mocha coffee maker, excellent Rapha cycling clothes etc etc. But, I do like the idea of bike packing being one of the most accessible and egalitarian ways of traveling the world, since almost everybody can afford it. Just do it!